I know I shared a frozen treat last week, but the dog days of summer are upon us and it’s almost impossible to resist not sharing anything but popsicles, fro-yo, and ice cream these days. This beautifully messy behemoth of a cake was actually made a few months ago for my Dad’s birthday and somehow I’ve held off sharing it with all of you until now. My sincere apologies!! My family is made up of ice cream fanatics, and we take our indulgences very seriously. One of my Dad’s favorite frozen treats is the Founder’s Favorite from Coldstone Creamery. 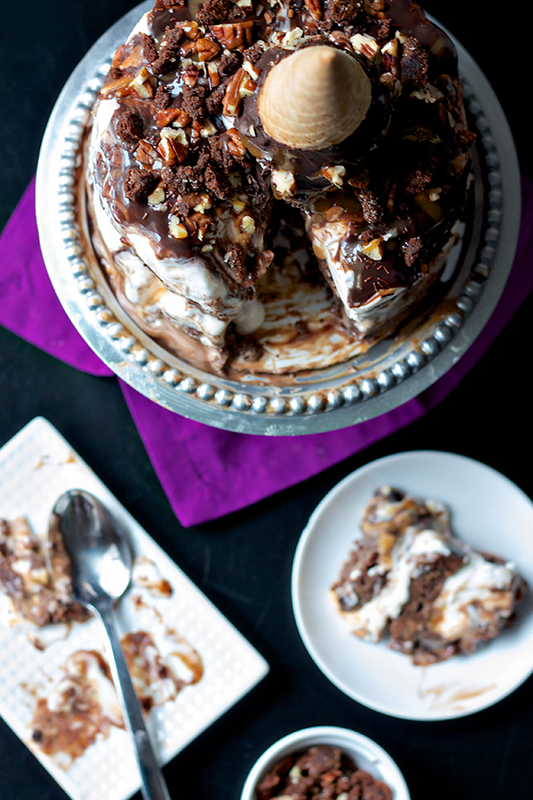 It’s classic, it’s certainly decadent, and not surprisingly, it turns out that the combination of brownies, caramel, pecans, hot fudge, and sweet cream ice cream makes for a great ice cream cake too. Such a classic mash-up of sundae toppings usually sounds a little blasé to me when I’m bombarded with Coldstone’s colorful array of choices. 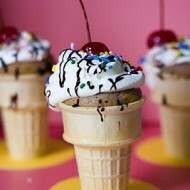 I tend to go for the more exciting ice cream base flavors, and add in all sorts of random things for my creations. But there’s a reason these ingredients have become such a classic, and why it’s dubbed the “favorite” on Coldstone’s menu. This stuff is good!! 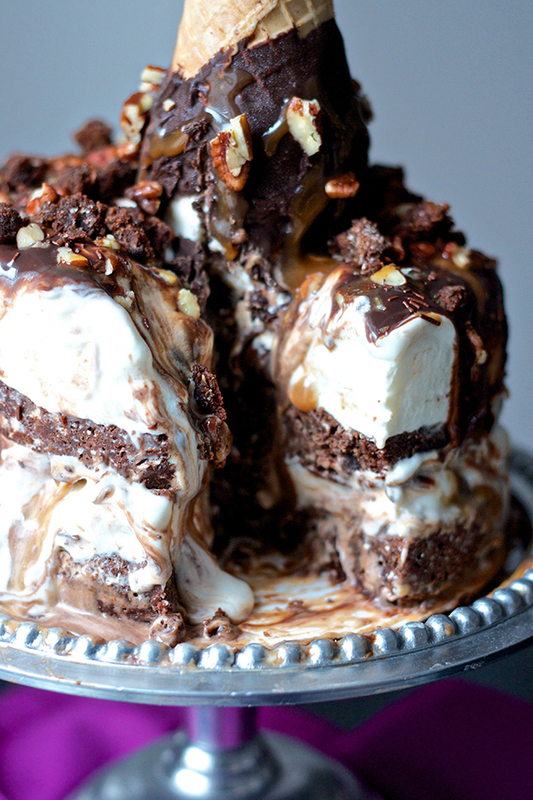 I’ve mimicked their creation in cake form by combining cake layers made from fudgey brownies that are sandwiched with homemade sweet cream ice cream and plenty of caramel, hot fudge, and pecans between each layer. 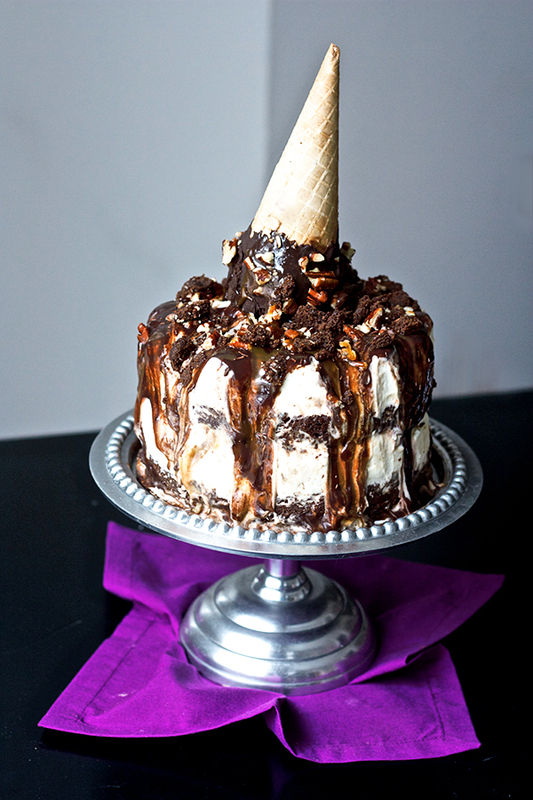 I’ve been dying to make a cake with a “melting” ice cream cone on top too, so this was the perfect opportunity. Mine is actually a store-bought Drumstick inverted on the cake and attached with a puddle of chocolate ganache. 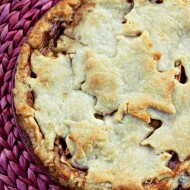 The great thing about this recipe is that all of the components can be store-bought to quicken things up. You can certainly make each part homemade, but since there are so many components, a few short cuts might help. 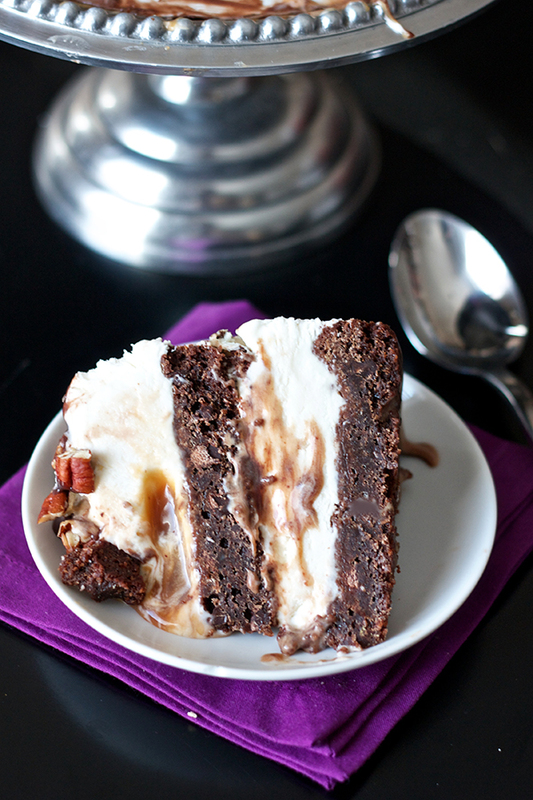 There is the option to use a boxed brownie mix, store-bought ice cream, as well as jarred caramel and hot fudge sauces. I made the sweet cream ice cream and hot fudge sauce myself, but cheated a bit with a box of brownie mix and the caramel sauce. 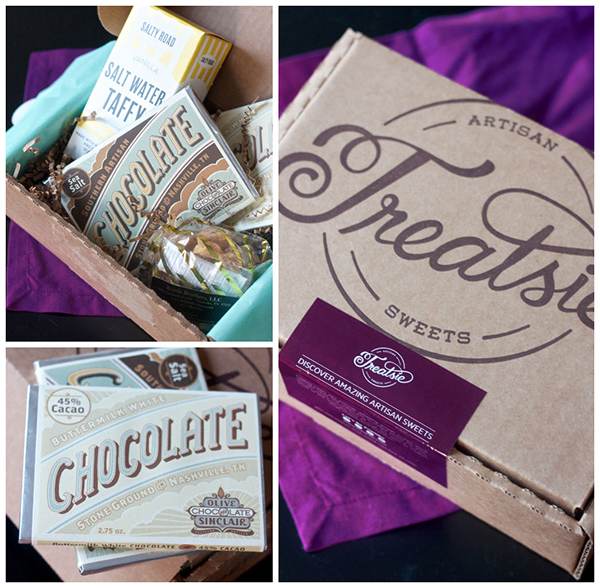 The sauce was actually sent to me from Treatsie – a monthly subscription box featuring premium sweets from small, independent candy makers from across the country. Think BirchBox or StitchFix for candy! My favorite part is that they help spread the word about small batch premium candy and dessert producers that you may not otherwise get the chance to try. And they were kind enough to provide a giveaway opportunity for my readers, so make sure to check out the details below! In my box I got 2 kinds of caramel sauces from Lick My Spoon out of Sarasota, FL and a salted one from CC Made of Berkeley, CA. As you’ll see from the photo below I also got to try a few kinds of chocolate, some amazing salt water taffy, and cashew brittle. Everything was packaged so nicely, it really was a treat to receive. The salted caramel sauce got worked into the ice cream cake, and it was sooo good, and so nice to skip the step of making my own caramel! If you love your Dad as much as I do, you’ll consider making this cake – regardless of how many components go into it! Skip some steps, don’t fuss about the messiness of it all, and enjoy it with a tall glass of milk. 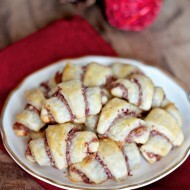 And of course, here are the giveaway details and the recipe! Head on over and enter the official contest on the Treatsie website to fill out the giveaway entry form. You’ll have to sign up for their email newsletter to enter, as well as leave a comment here with your favorite candy, which you’ll see within the entry form. You can get additional entries by following Treatsie and myself via multiple social media outlets – all of the links are available on the giveaway form once you do the first 2 required components. Contest ends Wednesday August 20th at 5PM EST. Winner will be announced on my Facebook page! Prize is a $50 gift card to Treatsie towards a subscription membership or anything on their site. Even if you don’t want to enter for the gift card, or if you don’t win the gift card, they’ve also provided a coupon code for all of you to use to get a free Treatsie box. Just use the code “fbericasweettooth14” and you’ll get one month’s box for free. Give it a try, I know you’ll love it just like I did! Spray two 6" round baking pans and a few muffin tin wells with non-stick spray and set aside. Prepare brownie batter according to your recipe or the box's instructions. Divide the batter so the two pans are filled about half way, then fill up a few muffin wells with the extra batter. Bake for about 20 minutes (you will have to reduce the recommended time for the brownies since we are using small pans here), or until a cake tester comes out clean. You can err on the side of slightly underbaked here since we want the brownies to stay nice and fudgey. Allow the brownie layers to cool in the pans for 5 minutes, then transfer to a wire rack to cool completely. If you're not immediately making the ice cream cake, wrap the layers tightly in seran wrap and store in an airtight container until ready to assemble. Crumble the brownies baked in the muffin tin to be used as brownie bits on the top as decoration. Make sure your ice cream maker has been in the freezer overnight prior to starting to make the ice cream. In a large saucepan, whisk together the sugar and cornstarch. Add the cream, milk, and corn syrup and whisk until smooth. Place the mixture over medium heat and stir constantly until it reaches a gentle boil. Once the gentle boil is reached, reduce the heat and allow the mixture to simmer, stirring constantly, for another 30 seconds. Strain the mixture over a fine mesh sieve into a large bowl and place a piece of plastic wrap directly against the surface of the mixture to prevent a skin from forming. Transfer the mixture to the fridge and leave it in the refrigerator until fully chilled (1-2 hours, or best overnight). Once fully chilled, transfer mixture to your ice cream maker and freeze according to manufacturer's directions, mine is about 25 minutes. You'll want to have your cake ready to assemble when the ice cream is done in the ice cream machine, so review the following steps so you're ready to go when the 25 minutes are up! Heat the heavy cream over medium-high heat in a small saucepan until a gentle boil is reached. Then remove from heat and immediately pour it over the chocolate chips. whisk mixture until totally smooth and set aside until it reaches room temperature. Line the bottom and sides of a 6" springform pan with parchment paper. You'll want the parchment paper to stick above the top edge of the pan, since the cake will be taller than your pan once fully assembled. Put the first brownie layer down and then spread half of the sweet cream ice cream mixture on top of the brownie. Drizzle on about half of caramel, a third of the ganache, and and half of the chopped pecans. Add second brownie layer on top and top with remaining ice cream. Return the cake to freeze for about an hour. Once re-frozen, remove the cake from the springform pan and place on a cardboard cake circle. Layer on the rest of the caramel on top and rewarm the ganache so it can drip over the sides of the cake. Place your drumstick or cone on top of the cake, pressing gently to submerge it in the ganache. Sprinkle on the remaining pecans, brownie bits, and drizzle extra caramel and ganache as you desire. Return cake to the freezer until you're ready to serve! Anything with caramel and chocolate – especially dark chocolate! I can always use a great avalanche in my frozen desserts. How decadent: I love this so much, Erica! Ice cream makes everything better. My favorite are Reese’s pieces! This is TOO good! Pinning!